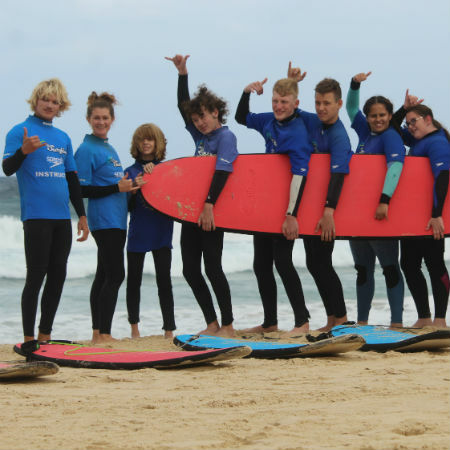 The Lets Go Surfing team in collaboration with Blind Sports NSW welcomed a group of people aged 9-19 to Bondi Beach for a surf lesson. Blind Sports NSW assists people who are blind and vision impaired to compete and participate in sports and recreation within NSW. The group arrived at Bondi with big grins ready for some time in the water. Wetsuits on and down to the beach, Instructor Marty described how to stand up onto the board so everyone could visualise what to do. Time to hit the water…one at a time each participant caught a wave on their stomach, then it was standing time .. the joy and excitement of each person experiencing the thrill of riding the wave either on their stomach or standing was a true inspiration to us all. We love sharing our love of surfing with one and all and were so excited to offer this amazing group some time in the water with us. Changing lives….. one wave at a time.